Systolic pressure belongs to the most important health indicators. Usually, a systolic pressure increases with age; therefore, adult people and especially elderly should measure their blood pressure within the circulatory system. There are several definitions of systolic pressure. But in simple words, a systolic pressure shows the pressure of blood in the vessels, when heart contracts and pushes out the blood into the arteries. The relevance of abnormal systolic pressure as a risk factor of arterial hypertension is beyond any doubt these days. Many clinical trials have proven that high systolic pressure causes different heart pathologies, stroke and kidney disease more often than high diastolic blood pressure does. The main signs and symptoms of high systolic pressure can be – dizziness, headaches, fatigue, dyspnea and nervousness. The symptoms of low systolic pressure are – reduced working capacity, poor memory, problems with concentration and low body temperature. A long-term high or low systolic pressure can be the symptom of many serious diseases. People, who often have such symptoms, should undergo medical examination. For most people, ideal systolic blood pressure is 120 mm Hg (diastolic pressure – 80 mm Hg). When the systolic pressure exceeds 140 mm Hg – it means a great risk for patient’s health. 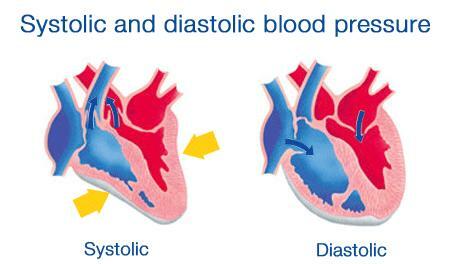 The higher the systolic pressure the more often small and large blood vessels in organs are damaged. These are for example, the blood vessels in the liver, kidneys or the brain. Uncontrolled high systolic pressure can cause the damage to the heart, heart failure and heart attack. How to lower the systolic pressure? Healthy lifestyle is the best method to prevent diseases and pathologies. A regular motor activity provides a beneficial effect and normalizes the blood pressure. The range of systolic pressure may vary during workouts and after. Therefore, you should measure the systolic pressure before doing physical exercises. In addition, you may check your blood cholesterol and blood sugar from time to time. It is recommended to be physically active at least 30 minutes a day. The loss of couple of extra kilograms may reduce the systolic pressure to 3-10 points. The main thing is that this method can improve your blood pressure without drug treatment. Physical activity along with proper nutrition can help to control the variation of systolic pressure. People with abnormal blood pressure should increase the consumption of fruit and vegetables and reduce the amount of high-calorie and fatty food. People should consume less amount of salt and alcoholic drinks. Smoking provokes high systolic pressure, worsening the condition of heart and blood vessels. Therefore, for an effective control of systolic pressure, it is better to quit smoking. Some people just have to change their lifestyle to normalize the systolic pressure. For other people, such changes are not effective enough and they need to use special medications to regulate the systolic pressure. Modern medicine offers a bunch of various medications to control the risk of cardiovascular diseases. Because of great variety of causes of high systolic pressure, there is no standard treatment program. If these drugs cause side effects, then other medications are prescribed. However, most of modern drugs can stabilize the systolic pressure quickly and safely. At the initial stage of treatment of high systolic pressure, the body needs to adapt to a new blood pressure level. You may have such side effects as headache, dizziness and any other unusual sensations. Usually, to control the systolic pressure, people just have to take one pill of antihypertensive drug a day. The dose can be increased, if needed. Some medications start working only a few days after you start using them. In order to reduce the risk of side effects, you should take medications when needed only. If you stop the drug therapy on your own, it may cause high systolic pressure again. Unfortunately, the number of people with high or low systolic pressure is not decreasing annually. Especially, this refers to the growing number of patients in developing countries. The total percentage of high blood pressure in adults is about 40% all over the world. The number of people with uncontrolled hypertension has increased from 600 million in 1980 to almost 1 billion in 2008. Why You Suffer From High Pressure And How Long It Will Continue?